On Friday, I learned that one can indeed get away from the sprawl. My friend Erin drove up from Maryland with her Morgan mare Belle and picked up Wizard and me for a trail ride in Assunpink Wildlife Management Area. On our last trip to the park, Wizard was extremely reluctant to load into the trailer so I had some concerns about how he would handle himself this time. There were several differences, though, in the trailering situation, so in the back of my mind, I was secretly hoping he’d hop right on. Erin’s trailer was a large, tall, airy stock trailer with no divider- the trailer was a step-up and not a ramp. Belle was already on the trailer, happily munching hay. I walked Wizard up to the trailer and he took a look inside. I straightened him out, and BOINK! he stepped right inside! I grinned ear-to-ear after seeing him load so easily. He trusted us… it was just the trailer he did not trust last time out. Erin is a top-notch trailer driver and Wizard arrived at the park happy and interested in our adventures. He unloaded as easily and stood quietly while he was saddled and when I got on. The first fifteen minutes of the ride were a little dicey for him, as he had not been ridden since I went to Kentucky and the weather was dry and cool. We tried a trot a few times and he just about jumped out of his skin, hopping around, and doing a few half-rears. I kept my cool and kept him moving forward and eventually he got the hang of things and settled. Since Erin had never been to the park before, I was the guide. Before our ride in September, I had not ridden in the park in over a decade :^) We did a few trot and canter sets through the fields. The cantering seemed to settle him the most. He crossed the stream with a little trepidation, but more confidence than last time. The park was stocked with pheasants for the hunters and we flushed a few along the way, but both horses were quite good about it. We rode out past the sheep farm and toward a road. We took a little branch off the road and found a fantastic trail with logs on it, and took a few little jumps. Well, they were little jumps but Wizard took them like they were huge. We cantered down and back up a little valley, and Wizard was excitedly snorting when we stopped. He really enjoyed the jumps! I was in search of Stone Tavern Lake, which we visited last time. We had some trouble locating it this time, so I asked some hunters. They seemed surprised that we were headed there, and said it was two miles down the road. Wizard and Belle are perfect trail buddies, since they have the fastest walks I’ve ever seen on three-gaited horses. We made short time of the trip to the lake and headed down a dirt road to the shore. The lake looked very different from last time, since we were on a different side. 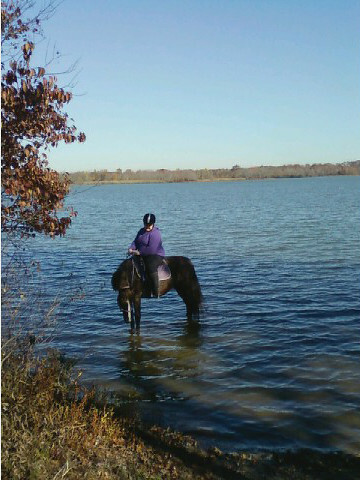 Belle, the seasoned trail mare that she is, stepped right in the lake and looked as if she might dive all the way in if Erin allowed her to do so. Wizard stepped right in the lake, but got a little nervous when the waves lapped at the shore. We took a quick picture of our friends in the lake and headed back on our way. The weather could not have been nicer, and Erin and Belle are wonderful company. I’ve known them both for several years and it’s always a treat to spend time with them. So how do we get back? Hm. We let Belle have her head and hoped she’d wander back to the trailer. We had been out for a good long time and it was time for Wizard to get back since he is not used to long rides. Locating the trailer proved more difficult than we expected. Wizard is usually no help in these matters, since he’ll just ride along wherever I point him. He did drift a few times, but it seemed like it was the wrong way. Belle took us to a few trails and a few uncut trails- she was working on a way back, but it seemed to bring us back in a circle. I called my friend and we got directions back. Even with the directions, it took a little while to get where we wanted to go. By the time we got back to the trailer we had ridden for about FOUR HOURS. I slithered out of the saddle and untacked Wizard. I had no expectation of riding nearly that long! I put his cooler on and grazed him for a little while. He hopped back on the trailer like a pro and we drove back to the barn. I gave him a good rubdown at the barn. I hoped he would not be half as sore as I was! And who said you can’t get lost in New Jersey??? We got far, far away from the suburban sprawl. ← Next Stop: Breeders’ Cup 2010! I’m glad you had a great time! Erin & Belle are THE BEST trail companions! Belle LOVES water… did she do her splashing? I’m glad that Wizard loaded right up… I LOVE Erin’s trailer and she is a top notch driver… I trust my horses with her!